Website Toolbox is a cloud-based community forum system that offers website managers a simple platform from which to create and moderate online forums. 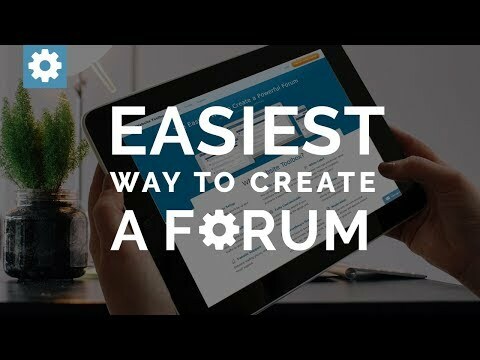 Incorporating customizable forums, social integration and a built-in calendar, Website Toolbox aims to deliver a user-friendly community forum solution. In order to create effective online forums, Website Toolbox equips users with the tools to customize their forum easily. With predesigned theme templates, Website Toolbox allows users to produce and personalize a community forum quickly and efficiently. Website Toolbox also promotes customizable branding by enabling users to utilize their current logo, domain name, CSS and website layout. Moreover, while Website Toolbox is embedded into the user’s website, Website Toolbox remains invisible to forum visitors. Website Toolbox provides users with a number of features intended to engage forum visitors such as social sharing functionality, instant messaging and file, photo and video sharing. To further enhance user interaction, Website Toolbox facilitates @mentions, community polls and automatic notifications. Furthermore, since Website Toolbox employs Unicode (UTF-), users can manage international forums successfully in any language. Website Toolbox seeks to improve administrative processes with single sign on, robust security controls and inbuilt mass emailing. Furthermore, Website Toolbox allows users to moderate forum activity directly with post approvals, detailed permissions and assigned forum administrators. They respond to support requests in a reasonable amount of time. They resolve issues on their end quickly. Communicating with my users has helped smooth a lot of potential issues.It was relatively easy to set up and works (mostly) seamlessly. Does very nice job of setting up PayPal subscription accounts for paid forum features. Also tracks when users respond to a post and e-mails me. It was relatively easy to set up and works (mostly) seamlessly. Does very nice job of setting up PayPal subscription accounts for paid forum features. Also tracks when users respond to a post and e-mails me. Occasional glitches. Was throwing users out of paid access for a while but customer service fixed that promptly. Sometimes a customer cannot sign in and the issue resolves itself in a day but i can never tell if it was a user error or temporary software glitch. It has a lot of action logging features that I don't have time to play with. Many features are over my head (and available time) to install or implement. You can blame that on my head and lack of time, or on the software not being as user-friendly as it could be. I don't have anything else to compare it to. Access issues for a visually disabled user. Maybe this is beyond anyone's capacity to fix but I have a visually disabled user who is unable to consistently access the forum. Has to do with her text reading software not able to pick up click boxes and the like. I think that a tech would need to sit down with her at her computer to adequately understand the access issue. I suspect this is commonplace. Thanks for the 5-star review! I'm glad Website Toolbox has been easy for you to set up and that you're earning money from your forum through our Paid Access feature! If you ever decide that you want to explore the more advanced features a bit more, try our help center for detailed guidance. Even better, just live chat, call, or email us anytime and we'd be glad to walk you through it! Our website forum is integral to our sales. As customers post photos on our forum it encourages others to buy the product. The forum provides a great customer community. It includes members from all around the world.The number one thing I love about Website Toolbox is the ease of integrating a forum into my website. The forum sits on their servers so there's no software or maintenance required on my end. In addition their team will work closely with you to ensure your forum looks exactly like your website. Plus the flat monthly fee includes unlimited image storage which is so important to us since we cater to woodworkers and almost every post includes images. Website Toolbox is continually improving and upgrading the software which I love. The number one thing I love about Website Toolbox is the ease of integrating a forum into my website. The forum sits on their servers so there's no software or maintenance required on my end. In addition their team will work closely with you to ensure your forum looks exactly like your website. Plus the flat monthly fee includes unlimited image storage which is so important to us since we cater to woodworkers and almost every post includes images. Website Toolbox is continually improving and upgrading the software which I love. I don't have any negatives. One feature I'd love to see in the future would be a built in translator for foreign language posts and for members from different countries to be able to view the forum in their native language. Built-in translation of user's posts to another user's current language is a fantastic suggestion. Thanks for that! We will add it in the future. Note that users can see the forum in their own language. The forum automatically detects the language that the user speaks and displays the forum in that language. 12 different languages are supported, and we can add any other language upon request. This is supported in any forum theme created within the last 2 years. Reliable and flexible, with good customer support. I run a discussion forum connected with a website. I have found the platform to be completely stable, and whenever I have had a technical query it has been quickly resolved.Ease of use, and flexibility, offering both Forums and Guestbooks. Very good customer support via online chat and email. Ease of use, and flexibility, offering both Forums and Guestbooks. Very good customer support via online chat and email. Limited range of design templates, some a bit dated now. Thanks for your review! I'm glad you loved our support and found Website Toolbox to be easy to use, reliable, and flexible. Please check out the two new themes called Classic and Material that we've launched over the last few months. A while before that we launched the Angela and Modern Elegance themes. We're also in the final stages of launching several new themes called Minimal, Lights Out, and Compact. All of the new themes have huge design improvements. Definitely take a look! We've also launched the newest and most powerful version of our easy theme editor, which gives you even more control over the appearance of your forum. So easy. So much customer support. Far less expensive than any other supported Discussion Forums. A simply excellent Discussion Forum to go with our Online Courses. We can set up separate discussion forums for separate courses. Our non-profit, community education organization researched about ten Discussion Forums before we found the wonderful Website Toolbox. All the rest are either too expensive for us to even consider, or free but totally unsupported and confusing, or have very confusing demos. In contrast, Website Tool Box provides a clear demo and a full feature free trial that has been so easy to set up, use and customize. The cost is less than per month instead of getting charged high by other supported Discussion Forums. We have been able to make our Discussion Forum confidential for use by students. We have found it to be well organized into Headings, categories, sub categories, topics and replies so we can set up separate Discussion Groups for separate courses. Our students who have been testing the forum find it easy to use and easy to follow. Ideal for groups of students taking a course together to use for high quality confidential discussions, as well as posting and giving each other feedback on assignments. The support provided by the Help Centre documentation, the live Chat Function and the Email questions and answers is simply amazing. Our non-profit, community education organization researched about ten Discussion Forums before we found the wonderful Website Toolbox. All the rest are either too expensive for us to even consider, or free but totally unsupported and confusing, or have very confusing demos. In contrast, Website Tool Box provides a clear demo and a full feature free trial that has been so easy to set up, use and customize. The cost is less than per month instead of getting charged high by other supported Discussion Forums. We have been able to make our Discussion Forum confidential for use by students. We have found it to be well organized into Headings, categories, sub categories, topics and replies so we can set up separate Discussion Groups for separate courses. Our students who have been testing the forum find it easy to use and easy to follow. Ideal for groups of students taking a course together to use for high quality confidential discussions, as well as posting and giving each other feedback on assignments. The support provided by the Help Centre documentation, the live Chat Function and the Email questions and answers is simply amazing. Thanks for those kind words Linda! I'm so happy to hear that Website Toolbox has provided an excellent experience for the students in your courses, while also being super affordable! We're here to support you each step of the way. Good luck! The overall platform has worked well for what we needed. I did have a period of time that users were unable to login and our forum was inactive for about a month. Besides the few small glitches I have had, it has been a great product and the customer service works hard to solve your issues. The customer service is amazing. They're always quick to respond and handle your issues. The customer service is amazing. They're always quick to respond and handle your issues. Functionality can, at times, be unstable if you embed into a Wordpress site. You cannot use your theme builder to change the page or the code will be damaged. All design of the page must be handled through Website Toolbox. This may not be an issue for other site builders. Thanks for your wonderful comments! We definitely do strive to have amazing customer support! Thanks for reporting the issue regarding not being able to use the WordPress theme builder without it damaging your embed code. I've escalated that to our Quality Assurance team for investigation. Can you contact our support team regarding this at https://www.websitetoolbox.com/contact so that they can discuss with you if they have any difficulty reproducing the issue? Thanks! Website Toolbox offers 3 pricing tiers. Website Toolbox supports social sharing, allowing users to share forum content effectively on social sites. Website Toolbox facilitates login with Facebook, offering users a simple sign in process. Website Toolbox provides a built-in chat room and instant messenger service, encouraging forum visitors to engage quickly and easily. Website Toolbox includes an online calendar, enabling users to organize events efficiently. Users can add their own advertising or charging subscription fees, helping users to monetize their forum. Below are some frequently asked questions for Website Toolbox. Q. What type of pricing plans does Website Toolbox offer? Q. Who are the typical users of Website Toolbox? Q. What languages does Website Toolbox support? Q. Does Website Toolbox support mobile devices? Q. Does Website Toolbox offer an API? No, Website Toolbox does not have an API available. Q. What other apps does Website Toolbox integrate with? Q. What level of support does Website Toolbox offer?